Forty to fifty percent of marriages in America result in divorce. 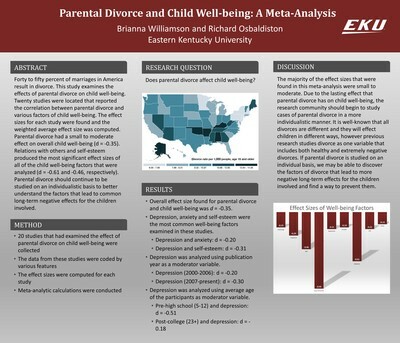 This study examines the effects of parental divorce on child well-being. Twenty studies were located that reported the correlation between parental divorce and various factors of child well-being. The effect sizes for each study were found and the weighted average effect size was computed. Parental divorce had a small to moderate effect on overall child well-being (d = -0.35). Relations with others and self-esteem produced the most significant effect sizes of all of the child well-being factors that were analyzed (d = -0.61 and -0.46, respectively). Parental divorce should continue to be studied on an individualistic basis to better understand the factors that lead to common long-term negative effects for the children involved.